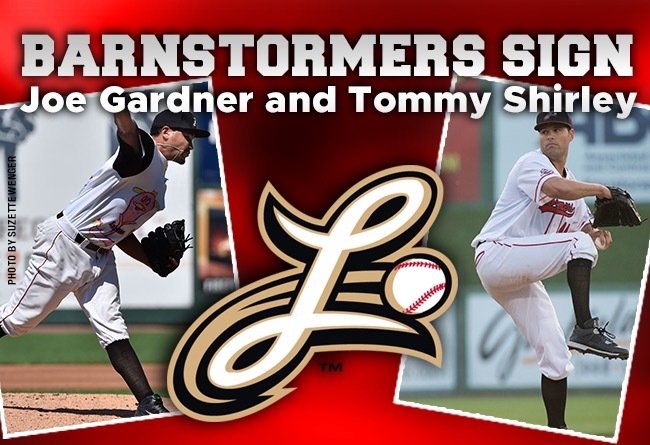 (Lancaster, Pa., Jan. 25, 2018) - Starting pitchers Joe Gardner and Tommy Shirley will return to the Lancaster Barnstormers in 2018, it was announced today by manager Ross Peeples. Gardner and Shirley become the fourth and fifth players under contract to the Barnstormers for the upcoming season, the second with Peeples at the helm. For Gardner, 2018 will mark his fifth season in a Lancaster uniform but the first time he has begun the campaign in Lancaster. The right-hander from Fremont, CA has arrived in the second half in each of the last two seasons. His longest stretch with the Barnstormers came in 2015 when he went 9-6 in 19 starts. He was 3-4 during Lancaster’s second half drive last year. Overall, Gardner, who will be 30 when the season begins, is 18-13 with a 4.27 ERA in 43 games (41 starts) in his four prior stints with Lancaster. Originally signed by the Cleveland Indians out of UC-Santa Barbara, Gardner won 13 games at the Class A level his first pro season in 2010. Following his time with the Indians, the right-hander spent more than two seasons with the Colorado Rockies system, pitching at Class AA Tulsa. His contract was purchased initially by the Chicago Cubs from the Barnstormers in 2014 and later by the Atlanta Braves that same season. Following impressive work in spring training, Shirley, 29, opened the 2017 season in the Barnstormers starting rotation but injured his left shoulder during his first start against Somerset. The southpaw from Western Pennsylvania returned to action at the end of June and strung together three wins in a span of four starts in August. He finished with a 3-5 record and 6.57 ERA for the year. Prior to coming to Lancaster, Shirley pitched for the Houston Astros and Detroit Tigers farm systems, peaking at Class AAA Oklahoma City and Fresno with the Astros. The Xavier University product’s best stretch came with Class AA Corpus Christi in 2014, going 7-3 with a 1.88 ERA. He was 7-7 for Fresno and 1-0 for Class AA Erie (Tigers) in 2016.